It's Spring time & you know what that means... Spring Cleaning! Quite literally: Cleaning out closets of unwanted clothes, drawers of unknown items that have been stuffed in & never to be thought of again, & basements of boxes that have accumulated over the years. Basically, 'tis the season to Marie Kondo everything, including a deep clean of the house. And while I like things to be clean & organized, the reason for getting into non-toxic cleaning goes much deeper. One of the first things I often share with people when teaching about essential oils is why I started using them myself, & why the need for non-toxic products in my life were so important. After learning that my very sensitive & easily irritated skin was not because of food or other allergies, I realized it was the chemicals, synthetics, & fragrances in my everyday products that were causing my skin to get itchy & red. So, I went on mission to start DIY’ing my own cleaning & lifestyle products & it soon became clear that essential oils were a great ‘ingredient’ in many of my recipes. I actually researched for a year & a half as to what company to go with & based on what I learned, it was no question it was going to be doTERRA due to their unprecedented quality & purity, & the company’s commitment to integrity & giving back. Since I have come to DIY only some of my home’s cleaning products because doTERRA does a great job of creating natural, non-toxic products that have essential oils in them which I’ve found to be much simpler & easier than choosing to make absolutely everything myself. So, what you’ll find in this guide-of-sorts are all my favorite essential oils, products, & recipes in order to create a home environment free of unnecessary & harmful toxic chemicals. BUT FIRST, WHY GREEN CLEANING? Creating a healthy lifestyle isn’t just about eating well & exercising, it also includes the products that you use in your home & on your body. And while this might not be the first priority for many (I know, bleach is the only thing that actually gets things clean, right? ), it is truly foundational when speaking of healthy living because if you’re doing all the right things with food & exercise, yet are inhaling or touching toxic chemicals on a daily basis, you’re just only seeing half the picture. What is fragrance exactly? It’s one of the most common ingredients in a household product. And it’s also one of the most toxic. “Fragrance” is a trade secret word that refers to an undisclosed number (could be hundreds) of ingredients that can’t be shared under the guise of being ‘propriety’ to the brand. Many of the ingredients that fall under the “fragrance” umbrella are banned in most other countries because, well, they’re toxic - neurotoxic, endocrine disrupting, hormone disrupting, & can cause issues like migraines, allergies, asthma, skin irritations, burns, cancer, poisoning, developmental problems & more. How do you know if there is fragrance in your cleaners & products? Read the label. Yep, just like food. And make sure to read the ingredients label, not just the front of the product packaging (aka the marketing). “Greenwashing” is a real problem, as there are many products out there labeled as '“natural” or “green” that you’ll see are full of toxic ingredients - when you read the label. EWG has a great Green Cleaning Guide if you want to dig deeper down this rabbit hole. This is a great resource that will tell you the toxicity level of a specific product or ingredient which is super helpful when you’re questioning or vetting a product. If you think conventional cleaning products & bleach can’t possibly be “that bad," consider this: your skin is your biggest organ, so everything that comes into contact with your skin is absorbed into your body. Similarly, any toxic fumes that you inhale are going straight into your body (as well as directly affect your brain). Ever get a headache after smelling bleach or perfume? Yeah, that’s not so good for you. So how bad are conventional chemical cleaners really? According to the EPA, “Americans, on average, spend approximately 90 percent of their time indoors, where the concentrations of some pollutants are often 2 to 5 times higher than typical outdoor concentrations” with cleaning products as one of the main contributing factors. And this statistic likely doesn’t even include personal perfumes/fragrance & other beauty products that are also filled with harmful ingredients. So bottom line: chemicals in conventional cleaning products do not make them more effective, clean better, or safer than natural alternatives. That’s just what brands want us to think. I’m sure your great great great grandmother was “just as picky” as you at getting things clean & germ-free - and did so without the use of toxic cleaners. So, what do we use then if not what’s on every grocery store & Target shelf in America? Enter: essential oils. Now essential oils are not the ONLY natural cleaning ingredients, not at all, but they are a super safe & effective ingredient to use when making your own or when looking at labels. Why? Essential oils are naturally antibacterial, antimicrobial, antiviral, antifungal, etc. Not because a chemist made them that way, but because nature made them that way. Essential oils are concentrated, distilled extracts from plants that - in nature - act as the plant’s natural defense mechanism against environmental threats & disease. Point being: essential oils are not “just pretty smells” or something “some people think work, but the jury is still out.” It’s actually chemistry (if science is your jam, dig in ALL YOU WANT right here with this 82 page essential oils chemistry e-book). Essential Oils are effective at killing germs. And because the chemical constituents found in these plants are so dynamic & complex, we don’t form a resistance to them or end up creating super bugs like we do with products like the aforementioned antibacterial hand sanitizers & soaps. And in case you’re still not so sure, this PubMed article specifically cites doTERRA’s OnGuard blend as “a possible antiviral drug for influenza virus proliferation control and treatment” & this Journal of Infectious Diseases & Preventive Medicine article from Johns Hopkins University speaks to essential oils as being the “future antibiotics” & “new weapons against emerging superbugs.” Again, fact. Not theory. Whew. OK. Enough facts & science. 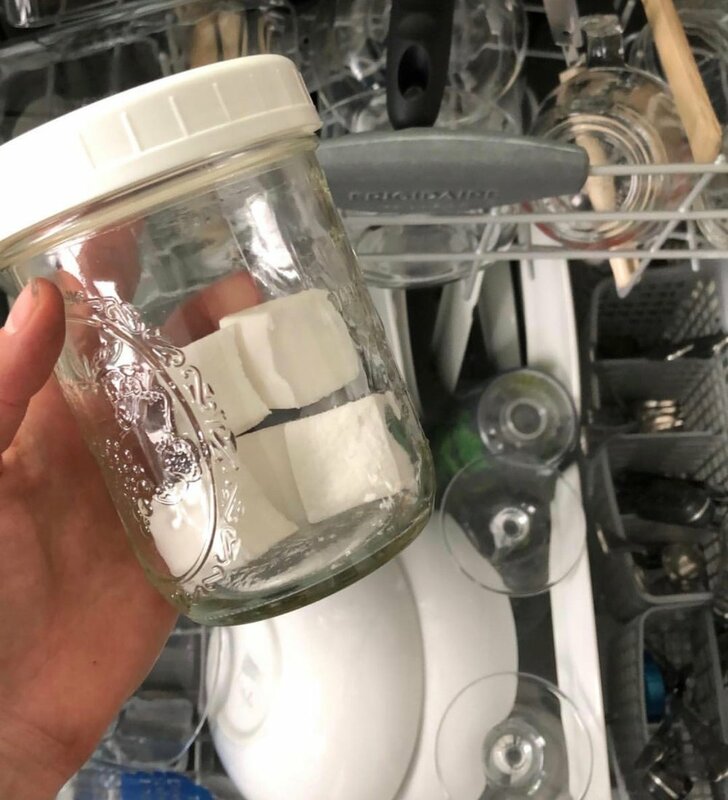 So now you’ve Marie Kondo’d every chemical cleaner under your sinks & in the basement, now what? Use this blog post as your simple guide to info, ingredients, products & recipes in how to green clean your home. While I know not every person wants to DIY things, I promise these recipes are easy. And as I mentioned above, I only DIY the things I need to. The rest I purchase from doTERRA because the ingredients are clean & it’s just easier. Once you get the hang of using your handful of natural products, you’ll realize how diverse & versatile they are - and WAY cheaper & easier than having a different product for every single cleaning need in your home. Need some inspiration to see how easy it can be? Check out my NON-TOXIC HOME Instagram Highlight for clips of what I’ve been making & how. Purchase my Non-Toxic Cleaning Starter Kit here. Even if you already have a doTERRA wholesale account, you can still order the items from this kit if you like. OR just browse & purchase what you like here. Mopping - Use either All-Purpose Spray recipe, but a scale up the ratio to fit your bucket, mop away. Swiffer - Use either All-Purpose Spray recipe & spray right onto the floor, then swiffer. 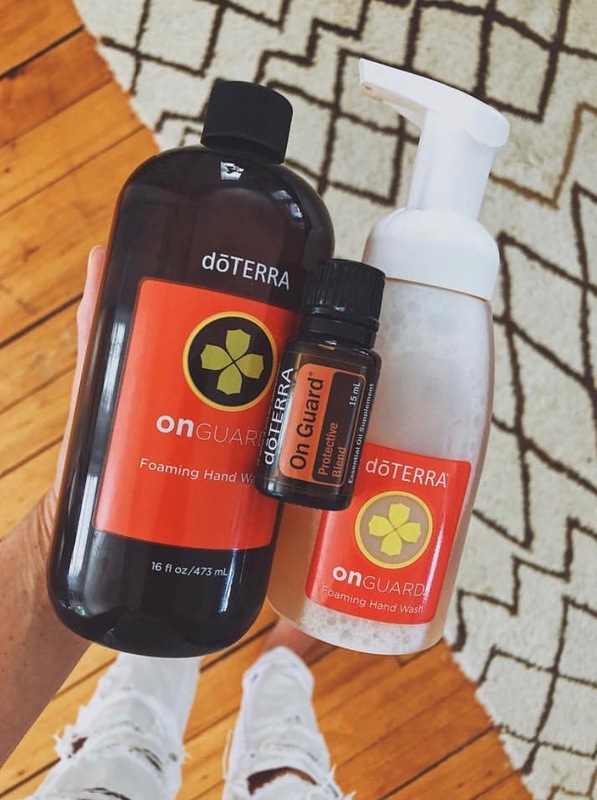 OnGuard foaming hand wash, perfect for sensitive skin! *same recipe as Carpet Deodorizer! *same as the Kitchen Floors & for any floors in the house! Extra tip: Check out my Be Well Bath Ritual blog post for more tips on oils in the bathroom. *same as the Kitchen Floors! Extra tip: Check out my Essential Oils (& more) for Sporty & Active People blog post for more tips on using oils with fitness. Article: EPA - What are the trends in indoor air quality and their effects on human health? Article: Journal of Infectious Diseases & Preventive Medicine - Essential Oils and Future Antibiotics: New Weapons against Emerging‘Superbugs’? Being healthy & ‘fit’ has less to do with what you look like, & more with how you feel& how you take care of yourself. Because true health is a life-long lifestyle, not a destination. So this one goes out to all my sporty peeps, gym rats, yoga chicks, & all those who move their body & want to up their game in a major way. Here’s a peek into my routine + my must-have tools to create a more holistic — & sustainable — fitness lifestyle. AND make sure to scroll down to the bottom & check out my custom Fitness Favorites Kit from doTERRA Essential Oils with (almost) everything from this blog post! Fresh breath, invigorating, & helps open your airways. Peppermint essential oils has also been proven to help oxygenate the blood which results in better athletic performance. Read more on that with this peer reviewed study here. I use this as lip balm, & because it has immune supportive oils like Frankincense & Melaleuca in it, it also acts as a protective barrier from any germs that I might encounter at the gym. I often rub a little under my nose as well for the same reason. And if you tend to get cuts & scrapes as you’re moving your body, you’ll definitely want this too. Think of it as your natural neosporin. I take this stuff EVERYWHERE, but especially to the gym (& offer it to others too!). I do a spray before & after so I don’t bring in any germs & so I don’t take any out with me. This stuff is the best. This is my go-to essential oil blend for my water bottle. It’s a blend of Peppermint, Ginger, Grapefruit, Lemon, & Cinnamon which makes it great for supporting the metabolism, cravings, helps maintain already healthy blood sugar levels, energy, digestion, respiration & of course hydration, all of which are super helpful in having a great workout. And dudes: while the name of this blend might seem like it’s not for you, I promise you will like it. EPSOM SALT SOAK - Step up your self-care by adding my Be Well Bath Ritual into your health & fitness routine. Yup, this mean you will need to slow down for a few minutes. Like literally sit down. In a bathtub. Epsom Salts contain Magnesium which not only help muscles, but also support digestion & release stress that can lead to pain in the body. Grab the Epsom Salts I use on my Amazon Wellness Shop. LIFELONG VITALITY TRIO - A trio of daily supplements including a Food Nutrient Multi-Vitamin Complex, Omega Complex, & Cellular Complex. Nutrition is truly the foundation of health with proper hydration, consistent physical movement, & limited toxic exposure being necessary pieces of the puzzle too. No essential oils or magical products are going to make you healthier & more well if you’re skipping past the basic building blocks & not fueling your body from the start. While I once thought supplements were only for professional athletes or those who were sick, I’ve since learned that we ALL need supplementation. No matter how organic, local, & clean your diet, you are most likely not getting the vitamins & nutrients you need because our soil has become so over-farmed & depleted. The apple or kale our grandparents ate 50 years ago, is unfortunately not the same as the apple or kale we eat today. The Livelong Vitality Trio are doTERRA’s #1 selling product (believe it or not, more than even Lavender essential oil) because they simply allow our bodies to do what they do best: come into balance & function optimally. And when we’re functioning optimally, we often notice a positive shift in things like digestion, immune system, mental clarity, mood, pain & inflammation. Get the ingredient list & every detail you could possibly want about these supplements right here. And they have a 30 day money back guarantee — so definitely worth giving a try. Some of my favorite fitness recovery tools are from a company called Rad Roller. They have a variety of rollers, balls, & sticks that are game-changing, in my opinon, for when you find tight muscles & knots in the body, but can’t get to a massage (if you can, GREAT, do that too!). In fact, I even travel with these too (& currently have one on my back as I type this on an airplane). You can find these Rad Roller tools & more on my Amazon Wellness Shop. Tip: Keep these tools & a yoga mat somewhere easy to access in your house. If they’re stuffed in a closet or the basement, you’re not going to use them. You don’t need a dedicated room, but even a basket in the corner can encourage you to so some rolling & stretching as you watch TV rather than sitting on the couch, for instance. Adding yoga into your fitness routine is so helpful in allowing your body to not just be strong, but gain flexibility that can reduce pain or potential injury. And perhaps even more imporatnt? Yoga is stress-reducing, which we all can use. When there’s stress in the mind, there’s stress in the body. If you don’t have a yoga studio near you or one that you resonate with, my favorite online classes can be found on YogaGlo.com & Gaia.com. These are seasoned & dyanmic teachers that have levels & styles for everyone. This one is a biggy for me, & the main reason I started using doTERRA essential oils & products, because I found that the more I was exposed to toxins in my everyday products (cleaning, lifestyle, beauty), the more my body (skin specifically), reacted. The ‘results’ from lowering your toxic load may or may not come in the form of weight loss, but certainly have an effect on hormones, emotions, inflammation, respiratory system & more which attribute greatly to your overall health & wellness. So just like food — read labels. Check for the word ‘fragrance’ or other known toxins that linger even in those ‘all natural’ products. The Environmental Working Group (EWG) website or app is a great resource to plug in a product or ingredient to check it’s level of toxicity & risk. Coming soon – Non-toxic cleaning & lifestyle blog post! As always, know that all recommendations are based on my personal experience & are only in reference to doTERRA Essential Oils, not any other brand on the market. What I share on this blog is not intended to treat, cure, or diagnose any kind of health ailment. AND get a 5ml Deep Blue oil + Deep Blue Lotion for Free ($65 value)? Want to browse other Starter Kit Options? One of my most favorite ways to relax & restore my mind & body is by taking a bath. When I begin this ritual process I know this is my time & helps to anchor my week (even if I do this in the middle of the week!) with a sense of calm & intentional self-care. My tub takes about 20 minutes to fill, so I set a timer as not to overflow the tub & so I can do all the bath prepping during that time. This list I’m sharing might seem like a lot when written down, but it's really not once you get your own routine down. Tip: make sure to keep all your favorite bath time essential oils & tools handy right in the bathroom so that you don't need to go running around the house collecting everything. This is just my personal ritual, so please allow yourself to find your own process, & in the meantime I hope mine might help you create or inspire yours. Tag me on Instagram at @mere_jane in your posts & use #BeWellBath so I can see yours! And I’ve also added my bath time faves to my Amazon Wellness Shop, check that out here. These two oils together create that fresh, relaxing, spa vibe. The earthy aroma makes me feel super grounded. This creates a great ambiance, especially when you can turn the lights off. Get a brush with natural, soft-ish bristles. Your brush should NOT scratch or leave marks, however your skin could get a little temporarily pink from the stimulation (that’s a good thing!). Especially those with sensitive skin (like me), make sure to get a brush that feels invigorating, not painful. Skin should be totally dry, before a shower or bath. I like to put 1 drop each doTERRA’s DDR Prime blend & Pink Pepper Essential Oils in my hands, rub them together, then rub my hand on the bristles to distribute the essential oil. Key here is you always want to be brushing in long soft strokes towards your heart. The lymphatic fluid flows through the body towards the heart, so it's important that you brush in the same direction. Start with the bottoms of your feet, then move upwards from ankles to knees to thighs to bum. You can pause & focus in any specific areas you need. Moving to midsection, I go upward, followed by clockwise strokes on the belly. Make sure not to forget your sides from your waist up to your armpits. Then chest going down towards the heart. Then palms of hands, followed by long strokes from tops of hands towards shoulders. And lastly you back, you’ll actually go down from neck area to your lower back. WHY DDR PRIME & PINK PEPPER? Now there are a number of Essential Oils you can use with Dry Brushing (or none at all), but with my personal history of not-so-normal-acting skin cells (know what I mean?) I want to use Essential Oils that specifically support cellular health & oxidative stress. DDR Prime is formulated just for this & Pink Pepper is high in Limonene, which is a chemical constituent that is germ-destroying, anti-inflammatory & supportive for stress in the body too. Turn on a podcast, a meditation, or simply enjoy the silence. Then the best part: finish your shower on ICE COLD. If you're new to this (or it's winter time), it's going to take some adjusting, so ease into how cold you make it & stay in it as long as you can. I promise it will get easier & you will learn to crave it. Even if all you can do is run the cold faucet over your feet & splash your face a few times, do that. No problem, you can create the same experience with a relaxing & soothing Foot Soak. Just grab a bucket! And in that case, I highly recommend choosing some oils from the Body Aches & Pains or Grounding category 👌🏼. Some essential oils can be hot or spicy, therefore I do not recommend using in a bath the following oils, but not limited to: Cinnamon, Clove, Cassia, Oregano, Thyme, Ginger. I also do not recommomend any citrus oils due to their potential to be photosensitive in the 48hrs following contact with the skin. If you’re using an essential oil blend, just make sure to read all the oils contained in that blend. Coming soon - Be Well Face & Body & Be Well Haircare blog posts! Don’t have Essential Oils yet? Hop over here for more info on how to get them at 25% off. INTUITION: the ability to understand something immediately, without the need for conscious reasoning. The more I dive deeper into my practice (& yes, I'd call it a practice) with Essential Oils, the more I realize that our body & emotions are often onto something well before our thinking brain is. While I really do like thinking of Essential Oils as being prescriptive - How do I want to feel? What do I want more of? Less of? Target the need or want & choose an Essential Oil (or oils) to use. Mission accomplished. On the other end of the spectrum, I also like to respect & let run free, the intuitive relationship I have with Essential Oils. This relationship is a bit more nuanced, & certainly seemingly less "logical" on the surface, but trust in this relationship is where major ah-ha's & breakthroughs can happen. So naturally, intuitively selecting an Essential Oil (or oils) stems from a slightly different line of questioning - What Essential Oil am I drawn to right now? And without yet asking "Why" or attributing any reason, practicality, or prior knowledge around this decision, just choose an oil & choose a way to integrate it. How would you integrate? Some examples might be: creating a diffuser blend, applying to your wrists, rubbing over your heart or the back of your neck, adding into a body oil blend, putting a drop in your hands & breathing it in before a meditation, or a meeting, or whatever it is you're about to go do, and so on. Don't allow for too much brain chatter, just integrate as your intuition tells you to integrate. Even if it doesn't "make sense." And before any brain interrogation begins, take a moment to experience the Essential Oil you’ve chosen. And I mean EXPERIENCE it - What do you smell? How does that aroma make you feel? Where does your mind go? How does your body react? Are you breathing deeper? More fully? Does your mind feel clearer? Mood brighter? It's sometimes immediately that I feel or know why my body chose that Essential Oil. Perhaps I've chosen this oil in a similar situation before, or perhaps I've reached for it a number of times recently. And other times it's less clear. In that case, I'll take it to a resource like my Emotions & Essential Oils book to look up the energetics or emotions of the Essential Oil (or oils) I chose or maybe something more clinical & look to my apps or resource books to read the health benefits & what systems of the body it supports to see if I can find any connection to either how I currently feel or what I might need - mind, body, or spirit. It's often then that I say "Ahhh, yep, that makes sense." Occasionally I might dig in to my resources & still see no real connection to why I chose it. It's in those times I trust that it was just what I needed in that moment. And leave it at that. As our emotions, energy, surroundings, physical body, etc, changes, that which we're attracted to changes. Today might be different than tomorrow, which night be different than next month, & next year. Truth time: I actually did NOT like the smell of Frankincense when I first opened the bottle. But I felt pulled to keep opening that bottle & smell it every so often. Now it's my most favorite Essential Oil & go-to happy place to de-stress & reduce anxious feelings. Along those lines, allowing myself to work intuitively with my Essential Oils also meant releasing judgment or opinion on the smell of an Essential Oil, more specifically: if I "like the oil" or "don't like the oil." Just like my Frankincense example, but also because our intuition often knows what we need before we do. When we create this judgment around what we '“like” or “don’t like” - & believe it - is when we step further away from our intuitive power. Again, it's a practice - so follow what's guiding you, trust it & integrate accordingly. Get excited when you see the patterns & don't worry about it when you don't. Do you use intuitively choose & use Essential Oils? What has been your experience? For those of us in doTERRA Essential Oil land, the most exciting day of the month is often the 1st. Why? Because that's when an email arrives into our inboxes with the new month's news & promotions. And September 1st was perhaps the MOST exciting "first of the month" I've ever experienced. So what's the Big News? The September promotion is 20% off Starter Kits. And this is by far my most FAVORITE promotion doTERRA has ever done. I, like a lot of people, am conscious, thrifty, & like to know that I'm getting the highest value when it comes to things I choose to purchase. I also demand quality & integrity with the companies & brands I choose to align with. I recognize that can be a tall order, but I bet you can relate, right? So what's the Big Goal? It literally lights me up knowing this extra special discount enables even MORE people to afford these powerful, healing oils, & enables them to begin a journey to change their health & the health of their family in a radical way. Are you new to doTERRA? Awesome, let's connect. I'd love to learn more about what your biggest health needs are & help you find solutions. Email me at bewellyogalifestyle@gmail.com to book an in-person or phone one-on-one session & we can figure out which discounted Starter Kit is best for you (take a peek below). Do you already have doTERRA Essential Oils? If you have ever found your Oils to positively benefit your health or the health of someone in your family, I have a favor to ask: Will you connect me with the person in your life that you think could most benefit from using them too? Email me at bewellyogalifestyle@gmail.com & CC that friend or family member letting them know why you think we should connect. I'd be so grateful to help them on their journey 🙏🏼. I know there are people & families out there that are just begging for natural solutions in their home & I am committed to helping as many homes become as resourced & empowered as I can. Have you been wanting to buy Essential Oils, but still not sure you can afford one of these kits? "Strategic" is one of my top 5 tested strengths (not kidding! ), so if you want Essential Oils in your home, but have any hang up or restriction -- I know we can find a solution, just let me know & I can help. And don't worry, I will never leave you hanging. No matter what kit you choose we will have a chat to go over exactly how to use each item, plug you into some incredible resources for education & I'm here to be your Essential Oils running buddy for life. Have questions? Already know what you want? Email me at bewellyogalifestyle@gmail.com & we'll get your Starter Kit ordered. "the most popular & versatile kit"
What is the financial $$$ breakdown? Who is this kit best suited for? This kit is for the person who wants to get started with the basics - the top 10 most popular, most versatile oils. If you're on a budget or just dipping your toes into natural wellness, this kit is for you. Why is this kit valuable? These top 10 oils (plus diffuser) will support MOST of the health needs that you come across on a daily basis. All those over the counter items you get at the drug store? Think of these as your natural swap for most. "the non-toxic, natural lifestyle kit"
This kit is for the person who wants the basic oils, but also wants to overhaul some key home & lifestyle items to be more natural & non-toxic. I always say to people if you're interested in more than just the oils & removing toxins from your products/home is a priority (& this kit fits into your budget)... GET IT! I also like to call this the "Best of Kit" or "Mini Diamond Kit" because it really does have a comprehensive selection of the most popular oils & products that people often end up purchasing in the next few months anyway. This is the kit I most hear people say "I wish I would have started with that one." "the all the oils right now kit"
This kit is for the person or family who wants all the oils at their fingertips right away & don't want to bother with ordering piecemeal. This might be a busy mom or business person who is low on time, but wants to have solutions right away when something comes up. I LOVE this kit. And other than being able to get every. single. oil. at once, here's the other coolest part: If you break this kit down to a monthly cost, it averages only to $121 per month over 12 months. If that sounds like a lot, think of all the other things you spend that much a month on (groceries, gas, over the counters, going out to eat & drink, coffee runs, gym memberships, clothes, makeup, I'm sure the list goes on). This kit is for the person who puts the health of themselves & their family first, period. This person is serious about health & wellness, & they want ALL the tools right away. Committing to this kit is committing to yourself & I give MAJOR props to the person with that foresight & determination. I mean the savings of $1213.33 should make the value pretty obvious, but how about all those CVS & target runs that end up being hundreds of dollars each time somehow? Toothpaste, deodorant, laundry detergent, hand soap, dish soap, vitamins... Yah, you won't be doing those anymore. #YoureWelcome. I am beyond excited to dig right into this lofty goal & get 18 homes stocked with these natural tools. If you have questions or know what you'd like to order, shoot me an email at bewellyogalifestyle@gmail.com.